How to watch Adult Beginners (2014) on Netflix Australia! Sorry, Adult Beginners is not available on Australian Netflix, but you can unlock it right now in Australia and start watching! With a few simple steps you can change your Netflix region to a country like France and start watching French Netflix, which includes Adult Beginners. We'll keep checking Netflix Australia for Adult Beginners, and this page will be updated with any changes. Adult Beginners is not available in Australia BUT it can be unlocked and viewed! A failed entrepreneur shows up at his sister's door and faces true responsibility for the first time when he's put to work as a nanny to his nephew. He's led a life of hipster success in New York. It's amazing how fast that life ended. Where to begin again? 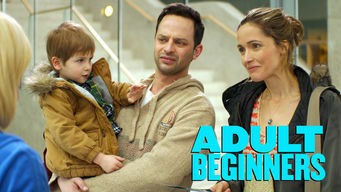 There is a way to watch Adult Beginners in Australia, even though it isn't currently available on Netflix locally. What you need is a system that lets you change your Netflix country. With a few simple steps you can be watching Adult Beginners and thousands of other titles!